Not everybody created their buns of steel, 6-pack abs, or defined bodies by battling through rush hour traffic to get to a gym or by waiting for their turn on the bench press. 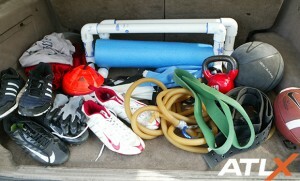 Roll by any park and you will see people unloading all kinds of workout equipment from the trunk of their cars. Many people have ditched the gym membership and invested in their own equipment, and they are getting the same benefits without the hassle of the big gyms. The gym does have some advantages, but people can easily overcome them, and get in a great workout without all of the bells and whistles that you find at corporate gyms. By using his own equipment and by using mostly body weight exercises, Cephas has maintained his muscular build, size and strength. A few pieces of equipment, coupled with a pull-up bar and bleacher steps at a park, provide a person all of the tools that they need to build strength and finely tune their bodies. Equipment such as the medicine ball, large rubber bands, a balance ball, and the ab wheel can all be easily transported, and they are all relatively inexpensive. For an even more intense workout, and to make all of the other weekend warriors at the park jealous, suspension systems and homemade equipment can take a workout to the next level. The medicine ball is one of the most useful pieces of equipment on the market because it can be effectively used to build and tone the upper and lower body by throwing it, lifting it, or holding it above your head while performing squats and lounges. Large rubber bands can be found hanging from pull-up bars at every CrossFit gym. The bands are extremely helpful for people who are beginners at pull-ups, which is a staple for bodyweight exercising. As a person gets stronger doing the movement with the band, they start doing the pull-ups without it. The bands can also be used for chest and leg workouts. For the chest, a person can wrap the band around their back, holding the band in both hands, and perform pushups, which is pretty difficult because of the resistance added by the band. For legs, a person can wrap the band around their shoulders and hold it down with their feet, and perform squats. Everybody wants a flat stomach. The ab wheel, which hit the scene through informercials, promised 6-pack abs and major weight loss in less than 20 minutes a day. The claims may have been outlandish, because that one piece of equipment cannot take the place of an entire diet and exercise program. But when used as one of many tools, the ab wheel is actually extremely effective. The ab wheel effectively works outs the core muscles, and the shoulders, triceps, and hip flexors get some action too. The nature of the movement causes a person to have to use their stabilizer muscles to a much greater degree than doing normal sit-ups and crunches. 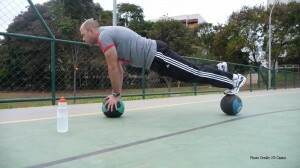 For greater stabilizing exercises, the balance ball will hit the spot. Working out on a balance ball, instead of a flat surface, forces a person to have to contract more muscles to balance themselves, instead of a bench doing the balancing work for them. There a several different positions that can be used on the balance ball to work the upper and lower body, and the core muscles. 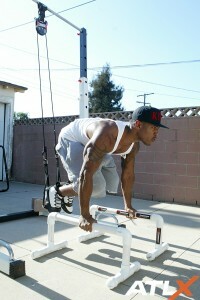 For next level type workouts, suspension systems such as the TRX work extremely well. The equipment can be attached to pull-up bars, and can be used for total body training. Cephas swears by the CrossCore 180, which he says is “like the TRX, but on steroids.” The CrossCore 180 has a pulley system that adds even more instability, and works out the muscle to a greater degree. Cephas has also made his own equipment using PVC pipes. He made parallettes for pushups and dips, and because he does advanced calisthenics, he performs handstand pushups on them. For about $35 of materials, the parallettes can be made, easily transported, and used for various types of upper body and core work. The parallettes can also be combined with suspension equipment and bands. Also, don’t forget about warming up properly, so toss a foam roller in the trunk. This self-myofacial release roller can make a big difference by making the soft tissue surrounding the muscles more flexible. The roller can decrease the chances of injury, and enhance athletic performance. Another benefit to owning transportable equipment is that it can be taken on trips out of town. Cephas said that he always takes his CrossCore 180 and large rubber bands with him, and he can get in his workouts right from his hotel room. For anybody looking to get in great shape without a gym membership, a lot of junk in your trunk can get you to your goals.